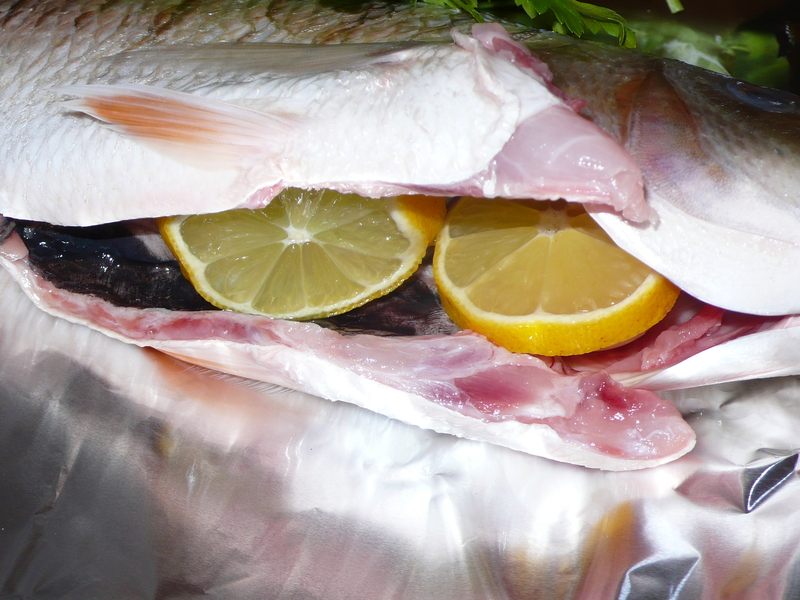 Nothing new going on over here, no recipe to follow today, but after making this gorgeous fish, I couldn’t resist the opportunity to show it off and talk a little about how I like to cook fish. 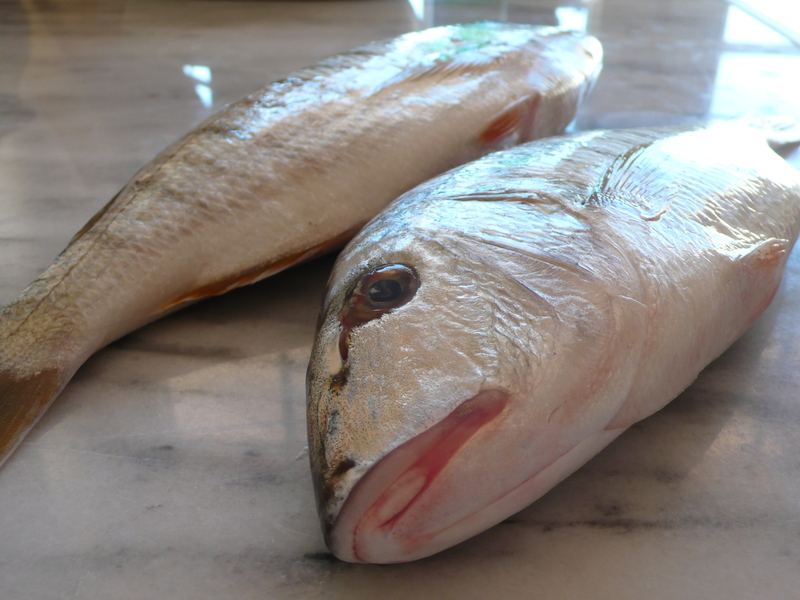 If my fish isn’t in risotto or a pasta, I usually make it the same way, either in parchment, roasted or poached. The most important thing about buying fish is that you make sure that it is fresh, this is the reason that I always like to buy fish with their heads still attached to their bodies. I want to be able to look them in the eye, and see if there is still a sparkle in there. I also want to make sure that all of their parts are still attached to their insides because that is another great indicator of a fresh fish. We are looking for red gills, not pink ones. I also prefer my fish to have all of its parts because it adds flavor to the meat, which is why I add so little flavor when I am cooking it. I want to taste the fish, I don’t want to taste anything else. Fish has such a delicate flavor, that even lemon can sometimes be too overpowering, even a drizzle of olive oil for that matter. If they are going in the oven I always stuff their bellies with garlic and parsley, a pinch of salt and a drizzle of olive oil. 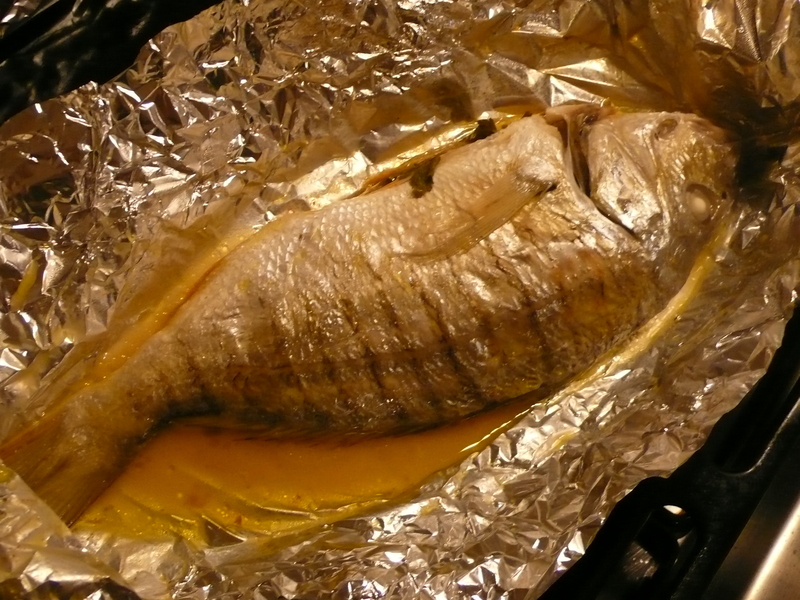 I will sometimes add lemon slices or substitute a different herb for the parsley, but I rarely mess with the skin of the fish and never add spice. 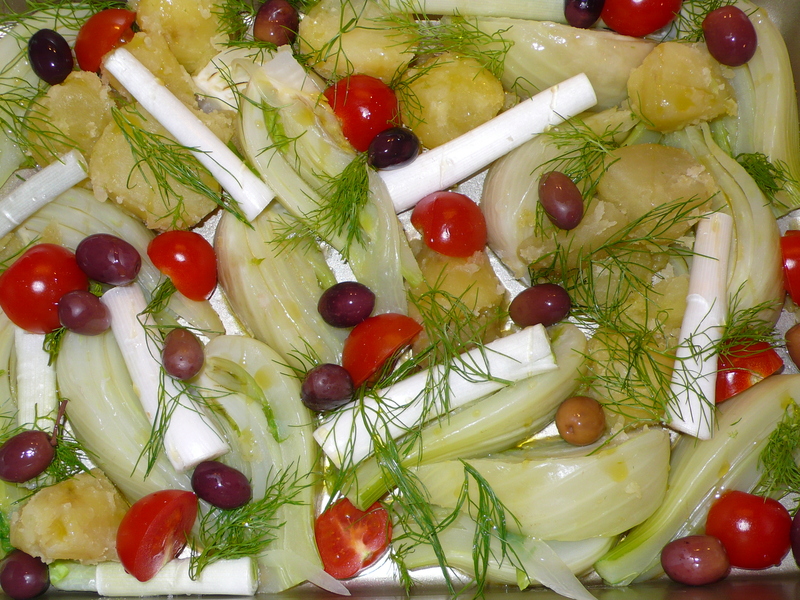 This is the Italian approach, which is always simple and always rooted in the superiority of the ingredients. They don’t need to add anything, because adding means that you are masking the flavor, and if you are masking the flavor then it probably isn’t fresh in the first place. 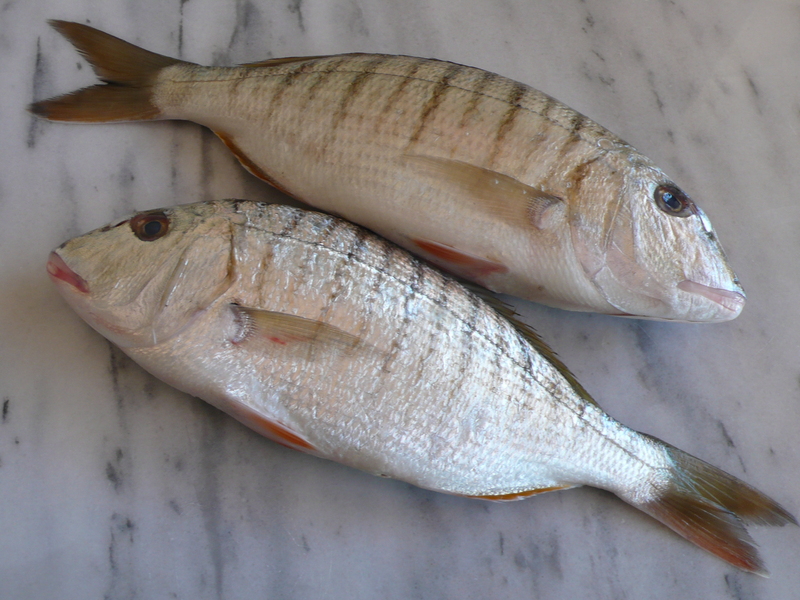 This is a mormora, or a striped seabream, not a fish that you find easily in the fish market, but it caught my eye and judging by the enthusiasm on my fish monger’s face when I asked about it, I figured it would probably be delicious. I can trust my fish monger to give me an idea of what type of fish I am getting if I don’t recognize it, he’ll tell me if it is a white fleshed fish, if it is oily, boney etc. I love that, I am such a foreigner in that fish market, a head taller than all of the little old ladies and men. They all turn their heads when I order, especially when I ask questions, which I assume are bizarre questions in their minds. I guess they were born knowing the name of every fish at the market, or their parents taught them. I am learning, but I did not grow up on a peninsula which stems off of another peninsula. I am so glad that I didn’t go with my regular spigola or orata, fish that I love, but they are always available and it is always nice to try something new. The mormora was delicious, I hope to find them again soon. 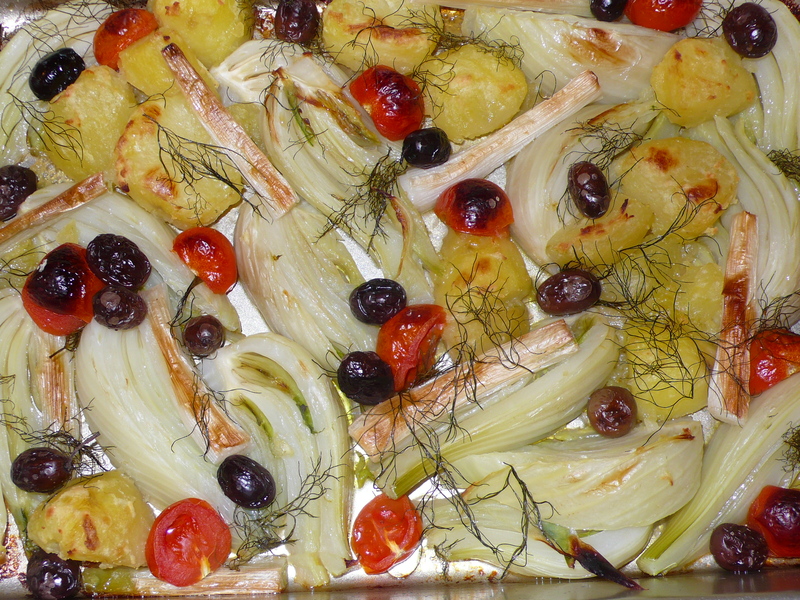 The roasted vegetables are like the roasted fennel that I made a while back, but I added potatoes to the mix. 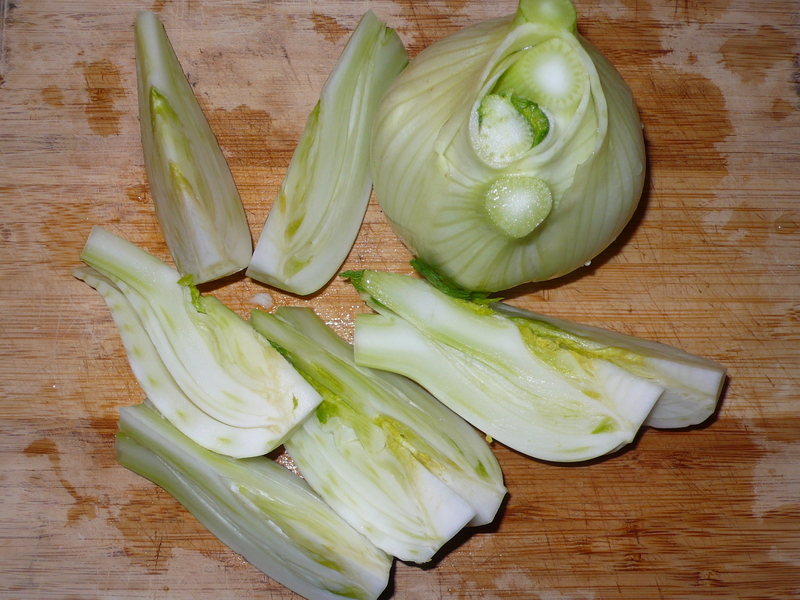 Boiling them first for a few minutes, shaking them up in the pan and then adding them to the fennel. ~ by italicious on April 1, 2014.